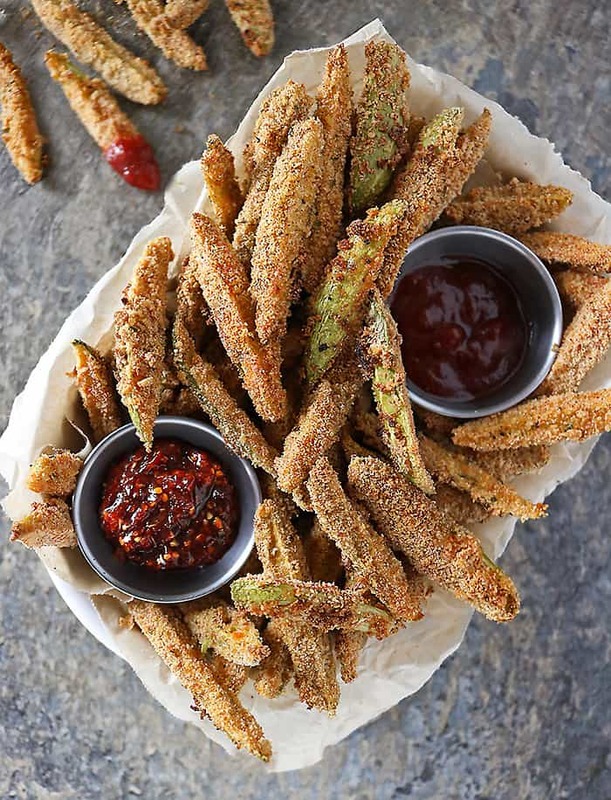 These Baked Spicy Tindora Fries would make a delicious, gluten free, snack or side dish to your favorite burger! We bet you’ll love ’em. 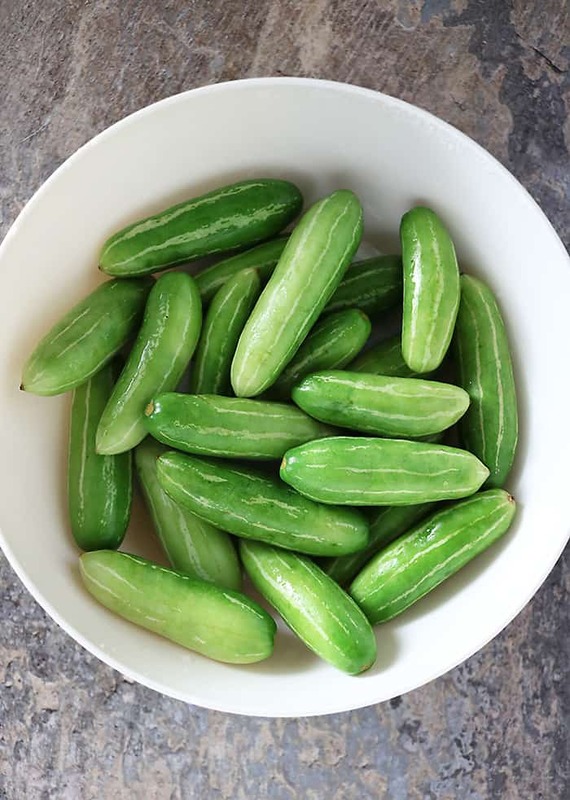 Tindora, known as ivy gourd, kowal, or scarlet gourd, is a vegetable that seems to always be flying off the shelf at Cherian’s, a South Asian store here in Atlanta, that I frequent. Part of the gourd family, Tindora, which goes by the scientific name of Coccinia grandis, is quite popular in the southern part of India. However, I don’t recall being introduced to it during my childhood years in Sri Lanka, which is located at the very southernmost tip of India. So, ever since I tasted tindora for the first time a couple of years ago, I have been on a mission to enjoy tindora every which way! I’ve made it into a curry, used it in a delicious stir fry and today we have Oven Baked Spicy Tindora Fries! Tindora looks a lot like mini-cucumbers. But they are a lot firmer to the touch than cucumbers are. Tindora are also said to have a higher nutritional value. 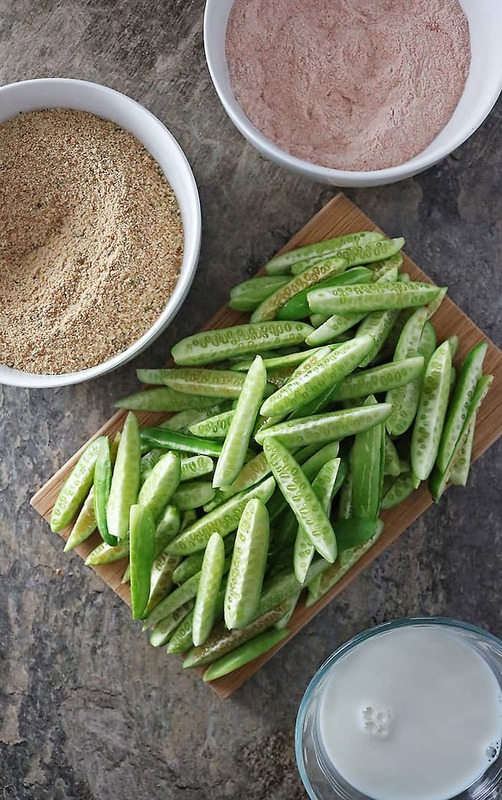 If you bite into a raw piece of Tindora, it is super crunchy (a lot crunchier than cucumbers are) but raw tindora leaves behind a slightly bitter aftertaste. As I’m not a huge fan of that bitter aftertaste, I prefer to enjoy Tindora curried, stir fried or baked! Where Can You Find Tindora? While most times I try to share recipes using ingredients that can be found at your local grocery store, I haven’t been able to find tindora at mainstream grocery stores, yet. Currently I have seen it at several South Asian stores and multi-cultural establishments like The Dekalb Farmer’s Market and the Buford Highway Farmer’s Market here in Atlanta, GA. However, after running into a huge jackfruit at my local Kroger and rambutan at the Walmart across the street, there’s no telling when tindora will make an appearance at a grocery store near ya! Getting back to these Baked Spicy Tindora Fries, I used gluten free bread crumbs and rice flour spiked with coriander, smoked paprika, salt and chili powder. 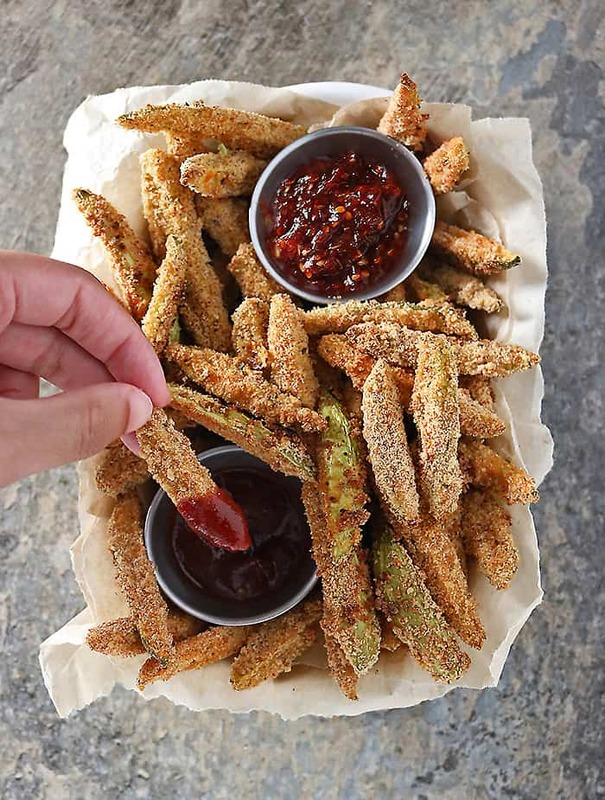 Which makes them a delicious, gluten free snack or side dish to your favorite burger! This recipe is really an easy one, the hardest part is to remember to not use one hand to dredge the tindora in flour, dip them into an egg wash and drop and coat them in the breadcrumbs. 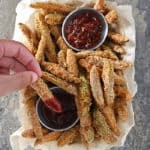 If tindora is hard to find, you can use this same recipe to make crunchy carrot fries or even crispy zucchini fries served up with a bit of ketchup and my favorite sweet chili sauce. This recipe first appeared on Food Fanatic ~ Make sure you stop by Food Fanatic and check out other delicious recipes! Wash tindora, pat dry and cut into quarters length-wise. Add the rice flour, coriander, 1 teaspoon of the smoked paprika, 1 teaspoon of the chili powder and salt into a bowl and mix well. Add milk into another bowl. In yet another bowl, add the breadcrumbs and the other teaspoon of smoked paprika and chili powder and mix well. Take the tindora slices, dredge each one in the rice flour mix, dip them into the milk and coat them with the spiced breadcrumbs. Place the coated tindora fries on a parchment lined baking tray and lightly spray with cooking spray. When all the tindora have been dredged, dipped in milk and coated in bread crumbs, bake them at 425°F for 10 minutes. Then, using a spatula, flip them over, spray with cooking spray and bake another 10 minutes. Serve warm with your favorite dipping sauces. Mmm, what is an interesting recipe. Great idea for snacks. I love it! I am going to try this out. Thank you for sharing this great recipe. YUM! These look so crispy and delicious! Such a great party snack too! I don’t think I’ve ever come across tindora here it Italy. 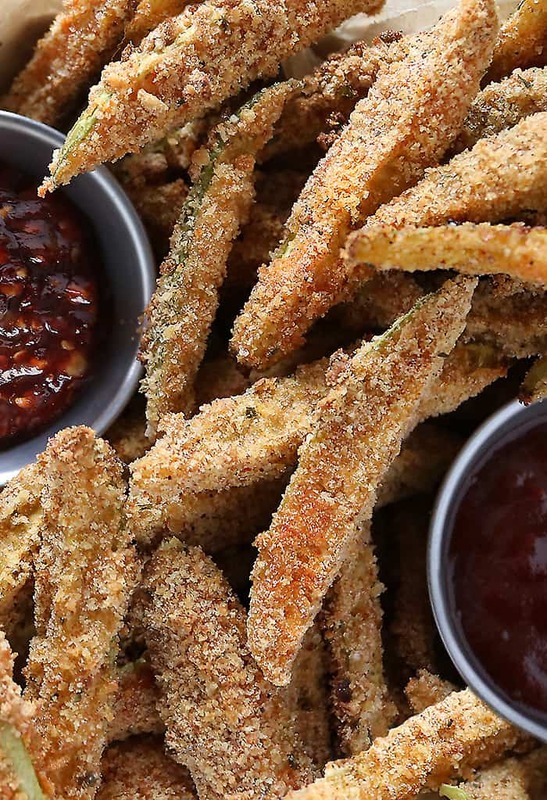 But, I love the idea of baking zucchini or carrot fries the same way! Oooh, they look crunchy! I think I’ve seen tindoras in my local whole food store, I’ll have to pick some up next time – thank you! I’m intrigued. Ive never had tindora before. I’m wondering if they have it at some of the local markets I go to. I’ll have to check it out. Great recipe! I’ll confess, I’ve never heard of tindora nor seen it in any of the groceries. But now I’ll certainly keep an eye out, you’ve got my curiosity up. Certainly worth a trip to the Asian market soon. Thanks, Shashi. I’ve never heard of tindora but I’ll make it my mission to taste it! I’m pretty sure there’s an Asian market close to me so I’ll have to stop there after my Pilates class this morning. I love trying new ingredients–thanks for letting me know about this one! Have a great week, Shashi! What a fun and delicious recipe! Wish I could have a bite! Yum, these fries sound delicious, Shashi! I must admit that I’m not familiar with tindora…you keep introducing me to the coolest new fruits and veggies. I’ll have to keep an eye out for tindora around here. I’m guessing this might be hard to find, but then again you never know! (Also, thanks for rubbing the DeKalb Farmer’s Market in my face…haha!) And I love the smoked paprika in your batter/rub! i hated these growing up but now you are making it look super cool and delicious as in fries. when im at the store next time, im picking these up.